Thirty-nine overprinted and re-valued definitive Danish stamps were issued between 1915 and 1927. It seems like a lot, and it may be, but there is a rationale behind this apparent madness. There are times when supply shortages or rate changes necessitate the availability of new definitive stamp denominations, and in many cases, existing stamps with these new denominations are not available. The short-term solution for this problem is to overprint and re-value existing stamps of other denominations. During this period, there were not an unreasonable number of re-valuations. Between 1915 and 1918, new 27 Ø. and 80 Ø. stamps were needed. Between 1921 and 1926, new 08 Ø. and 20 Ø. stamps were needed. Between 1926 and 1927, new 07 Ø. and 12 Ø. stamps were needed. What makes this time-period look so complex though is the fact that many different types and denominations of stamps were used for overprinting, during some of these re-valuation efforts! The two overprinted and re-valued Danish stamps shown above were issued in 1915. The stamps used were the 12 Ø. denomination postage stamp of 1895 and the 8 Ø. denomination official stamp of 1899. The 80 Ø. on 12 Ø. denomination exists with the frame inverted, and the 80 Ø. on 08 Ø. denomination exists with the "POSTERIM" error. 80 Ø. on 12 Ø. (1915 - Sc. #136) - Slate & Dull Lake. 80 Ø. on 08 Ø. (1915 - Sc. #137) - Carmine. 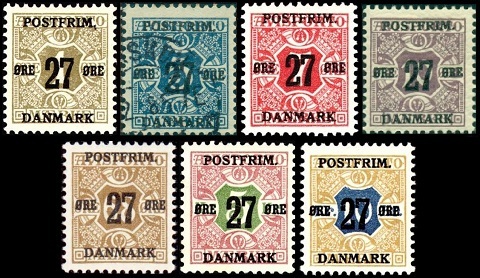 The seven overprinted and re-valued Danish stamps shown above were issued in 1918. These newspaper stamps of 1907 are typographed on paper with the crown watermark, and they are perforated 13. 27 Ø. on 01 Ø. (1918 - Sc. #138) - Olive. 27 Ø. on 05 Ø. (1918 - Sc. #139) - Blue. 27 Ø. on 07 Ø. (1918 - Sc. #140) - Carmine. 27 Ø. on 10 Ø. (1918 - Sc. #141) - Deep Lilac. 27 Ø. on 68 Ø. (1918 - Sc. #142) - Yellow Brown. 27 Ø. on 05 K. (1918 - Sc. #143) - Rose & Yellow Green. 27 Ø. on 10 K. (1918 - Sc. #144) - Bister & Blue. 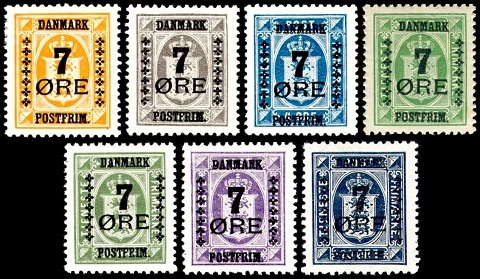 The ten overprinted and re-valued Danish stamps shown above were also issued in 1918. These newspaper stamps of 1914-1915 are typographed on paper with the multiple cross watermark, and they are perforated 14 x 14 1/2. 27 Ø. on 01 Ø. (1918 - Sc. #145) - Olive Gray. 27 Ø. on 05 Ø. (1918 - Sc. #146) - Blue. 27 Ø. on 07 Ø. (1918 - Sc. #147) - Rose. 27 Ø. on 08 Ø. (1918 - Sc. #148) - Green. 27 Ø. on 10 Ø. (1918 - Sc. #149) - Deep Lilac. 27 Ø. on 20 Ø. (1918 - Sc. #150) - Green. 27 Ø. on 29 Ø. (1918 - Sc. #151) - Orange Yellow. 27 Ø. on 38 Ø. (1918 - Sc. #152) - Orange. 27 Ø. on 41 Ø. (1918 - Sc. #153) - Yellow Brown. 27 Ø. on 01 K. (1918 - Sc. #154) - Blue Green & Maroon. The five overprinted and re-valued definitive Danish stamps of 1921-1922 shown above were issued between 1921 and 1926. 08 Ø. on 07 Ø. (1922 - Sc. #161) - Orange. 08 Ø. on 12 Ø. (1921 - Sc. #162) - Gray Green. 08 Ø. on 03 Ø. (1921 - Sc. #163) - Gray. 20 Ø. on 30 Ø. (1926 - Sc. #176) - Orange. 20 Ø. on 40 Ø. (1926 - Sc. #177) - Dark Blue. The four overprinted and re-valued definitive Danish stamps of 1913-1926 shown above were issued between 1926 and 1927. 07 Ø. on 08 Ø. (1926 - Sc. #181) - Gray. 07 Ø. on 27 Ø. (1926 - Sc. #182) - Vermilion & Black. 07 Ø. on 20 Ø. (1927 - Sc. #183) - Red. 12 Ø. on 15 Ø. (1926 - Sc. #184) - Violet. 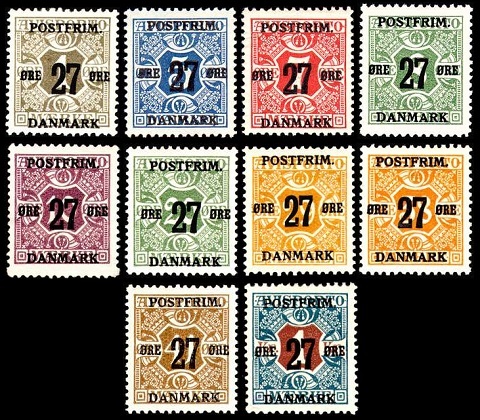 The seven overprinted and re-valued Danish stamps shown above were issued in 1926. These official stamps of 1914-1923 are typographed on paper with the multiple cross watermark, and they are perforated 14 x 14 1/2. 07 Ø. on 01 Ø. (1926 - Sc. #185) - Orange. 07 Ø. on 03 Ø. (1926 - Sc. #186) - Gray. 07 Ø. on 04 Ø. (1926 - Sc. #187) - Blue. 07 Ø. on 05 Ø. (1926 - Sc. #188) - Green. 07 Ø. on 10 Ø. (1926 - Sc. #189) - Green. 07 Ø. on 15 Ø. (1926 - Sc. #190) - Violet. 07 Ø. on 20 Ø. (1926 - Sc. #191) - Indigo. 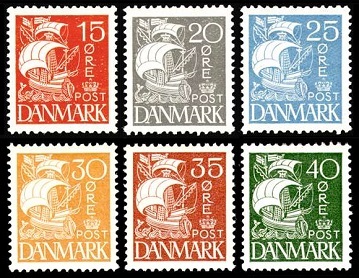 The six new definitive Danish stamps shown above were issued on January 2, 1927. They are typographed (solid background) and perforated 14 x 14 1/2. The common design features a 16th Century Caravel. 15 Ø. (1927 - Sc. #192) - Red. 20 Ø. (1927 - Sc. #193) - Gray. 25 Ø. (1927 - Sc. #194) - Light Blue. 30 Ø. (1927 - Sc. #195) - Ocher. 35 Ø. (1927 - Sc. #196) - Red Brown. 40 Ø. (1927 - Sc. #197) - Yellow Green.